Dow fell 48, decliners over advancers 3-2 & NAZ was 20 lower. The Financial Index fell fractionally to just above 210. The MLP index was up a fraction in the 403s after trading sideways in Q3 & the REIT index lost pocket change in the 262s. Junk bond funds were flattish & Treasuries had a 2nd straight weekly gain as European leaders struggle to resolve the region’s debt crisis & reports suggest slower US growth, sustaining the appeal of the world’s safest assets. Oil & gold were flattish but gold had a very good Q3 with plenty of talk about $2K gold again. Spain’s banks have a combined capital shortfall of €59.3B, according to a stress test the Spanish gov commissioned. That figure doesn’t include impact of mergers underway or differed tax assets. Including those 2 elements, the shortfall declines to €53.7B. Banco Populat Espanol needs €3.22B in an adverse scenario, after the tax impact. Banco Santander, Banco Bilboa Vizcaya Argentaria, CaixaBank, Banco Sabadell, Kutxabank, Bankinter & Unicaja need no additional capital, the Bank of Spain said. 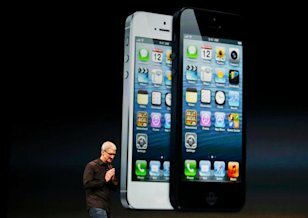 Apple has endured a week-plus of heavy & rare criticism for the lousiness of the Maps program on its new iPhone 5. CEO Tim Cook is pleading for forgiveness. He said that AAPL had let its customers down by putting out a subpar product. "We are extremely sorry for the frustration this has caused our customers and are doing everything we can to make Maps better." The iPhone 5 went on sale Sep 21, & complaints about the shortcomings of the Maps program started early & came often. Phone buyers felt Apple Maps wasn't even approaching the standard set by Google Maps (GOOF), much less surpassing it, prompting a frantic search for a replacement. For Cook, the apology comes only days after one of the biggest Apple product launches he's overseen since the death of company co-founder Steve Jobs. The stock lost $13 today & is down $37 from its recent record highs. Dow lost ground this week but rose over 500 in Q3. It's up 1.2K YTD for a 10% gain. That is impressive considering the soggy state of the economy which seems to be getting worse as the fiscal cliff approaches. Q4 generally is a good time for the markets, maybe not this year. Sep is the worst month for the markets but this year Dow gained 350. The jobs report on Fri will set the tone for the rest of Q4. Dow dropped 91, decliners ahead of advancers 5-2 & NAZ fell 19. The Financial Index was 1+ to the 209s. The MLP index pulled back 2 to 401 & the REIT index fell fractionally to 262. Junk bonds funds edged higher & Treasuries were strong. The yield on the 10 year Treasury is down 30 basis points in the last 3 weeks. Oil headed for a 2nd weekly loss (but flat today) on concern that slower economic growth will reduce demand & as the OPEC secretary- general said supplies are ample. Gold was slightly lower. US business activity unexpectedly contracted in Sep for the first time in 3 years, adding to signs manufacturing will contribute less to the economic recovery. The Institute for Supply Management said its business barometer fell 49.7 this month from 53 in Aug. A reading of 50 is the dividing line between expansion & contraction. Uncertainties surrounding domestic fiscal policy & weakening economies in Europe & China may prevent companies from adding to headcount & ramping up production. Slow growth prospects prompted the Federal Reserve to announce more accommodation measures earlier this month in a bid to help spur the 3-year-old expansion. The estimate was the gauge would fall to 52.8. One more negative sign about the health of the economy. Americans boosted spending in Aug even though their income barely grew. Much of the spending increase went to pay higher gas prices, which may have forced consumers to cut back elsewhere. The Commerce Dept said that consumer spending rose 0.5% in Aug from Jul, the biggest jump since Feb. Still, the increase was driven by a 1.7% surge in purchases of nondurable goods, largely reflecting a sharp rise in gas prices during the month. Spending on durable goods rose 0.3%, helped by gains in auto sales. Spending on services rose just 0.2%. Income rose just 0.1%, reflecting the weak job growth. Taking into account inflation, after-tax incomes actually fell 0.3% in Aug, the poorest performance since Nov. High unemployment and weak wage growth have kept Americans from spending more freely, which has held back growth. The economy grew at an annual rate of 1.3% in Q2, down from the 2% growth rate in Q1 & far too weak to lower the unemployment rate at 8.1%. Earlier this month, the gov released a mixed report on retail spending that showed that consumers are feeling pinched by higher gas prices. Nike declined the most in almost 3 months after reporting future orders that trailed estimates as demand sank in China. CEO Mark Parker has been discounting merchandise in China to clear inventory that wasn’t selling well, hurting demand for new products. Future orders from China, excluding currency fluctuations, declined 6%, trailing the average estimate for a 1.2% gain. Total orders for the Nike brand from Sep-Jan advanced 8%, trailing the 10% estimate. The economy in China “appears to be slowing, creating a short-term impact to any business operating there,” Charles Denson, president of the Nike brand, said. He declined to say when results in China would improve. EPS was $1.23 a share, down from $1.36 a year earlier. The projection was for $1.13. The profit drop was the 2nd straight decline after 9 straight quarterly gains. There is a significant glut of inventory in athletic apparel and footwear. A year ago, NKE orders for China rose 22%. While total revenue rose 9.7% to $6.67B, which also topped estimates, profitability was hurt by higher costs for labor & materials. Gross margin narrowed 0.8 percentage point to 43.5% from a year earlier, the 7th straight decline. The stock fell 1.63. There were more signals that all is not well around the world. Europe is in a recession & Spain may be on the brink of asking for a bailout. China is doing a lot better than most other countries, but its growth is below what it would like to be. The US economy is soggy & these conditions are not going to get better before the elections, at a minimum. The fiscal cliff keeps getting closer & companies hesitate before expanding & hiring more workers. Dow is just below the technically important 13.4K floor. We'll see if that holds which would signal more troubling times ahead..
Dow climbed 72, advancers ahead of decliners 3-1 & NAZ was up 42. The Financial Index rose 2 to go over 210. The MLP index was up 3 to 403 (only 8 below its record high reached in early 2012) & the REIT index was up 1+ to the 262s. Junk bond funds were mixed to lower & Treasuries slipped back in a rising stock market. Oil added almost $2 & gold surged $27 (bets against stimulus programs). Demand for US durable goods, other than transportation equipment, unexpectedly dropped in Aug for a 3rd consecutive month, signaling that slowdowns in business investment & exports will restrain the economic expansion. Orders for goods meant to last at least 3 years, excluding volatile demand for airplanes & automobiles, fell 1.6% last month after decreasing 1.3% in Jul, according to the Commerce Dept. Total bookings plunged 13.2%, the most since Jan 2009, as demand for civilian aircraft collapsed. This is chilling data. Companies such as Caterpillar, a Dow company, are cutting forecasts as slowing global growth dents sales, while the approaching fiscal cliff of tax increases & gov budget cuts is causing US businesses to curb spending. The forecast was for a 0.2% gain in ex-transportation goods orders & the Jul data was revised down from a previously reported 0.6% decrease. The US economy grew less than previously forecast in Q2, reflecting slower gains in consumer spending & farm inventories. GDP expanded at a 1.3% pace in Q2 after growing at a 2% rate in Q1. The revision compared with a prior estimate of 1.7% & 1.7% expected by analysts. Household purchases, about 70% of the economy, rose at a 1.5% annual pace, the slowest in a year after a previously reported 1.7% gain. Purchases advanced at a 2.4% rate in Q1. The drought caused the gov to revise down estimates for farm inventories, which also contributed to the smaller reading in GDP. Q3 stockpile readings will also be depressed by smaller farm inventories due to the weather, the Commerce Dept said. After growing at a 4% pace in Q4 2011, the deceleration over the past 2 qtrs shows the US is struggling to gain momentum as consumer & companies curb spending. To speed the expansion & reduce 8.1% unemployment, the Federal Reserve said it will expand its holdings of long-term securities & keep its target interest rate near zero until at least mid-2015. US oil production surged last week to the highest level since Jan 1997, reducing the country’s dependence on imported fuels as new technology unlocks crude trapped in shale formations. Crude output rose 3.7% to 6.5M barrels a day, according to the Energy Dept. America met 83 % of its energy needs in the first 6 months of the year. If the trend continues thru 2012, it will be the highest level of self- sufficiency since 1991. Imports have declined 3.2% from the same period a year earlier. A combination of horizontal drilling & hydraulic fracturing, or fracking, has helped reduce America’s reliance on foreign oil. The same technology unleashed a boom in natural gas output from shale that pushed inventories to a record last year. In addition to benefiting energy companies, MLPs are investing heavily in infrastructure to move this energy around the US. There is less going on in the markets than today's rise suggests. The Dow chart below shows how it has been lumbering along for 2 weeks (after reaching a 4 year high). The economic news continues to be dismal. While the revision downward for US GDP in Q2, is history, the implications for Q3 & Q4 are not good. The weak countries in Europe remain weak, hoping another round of bailouts will cure fundamental problems. China is in its kind of recession, growth at "only" a 7% rate. Next Fri will be the jobs report for Sep & it's difficult to make a case for a positive report. Then earnings season begins which could bring disappointment. Dow is still barely above the important 13.4K floor.